Blue font denotes premium content for Chimera Reserch Group subscribers. 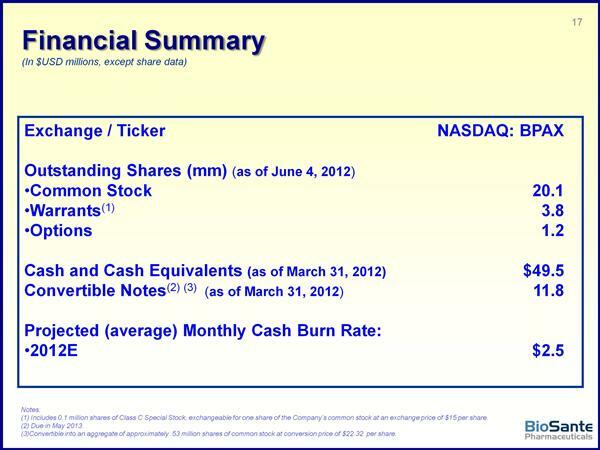 Stifel Nicolaus webcast 9/7/11 - click here for my notes. Rodman and Renshaw 9/12/11 - click here for my notes. 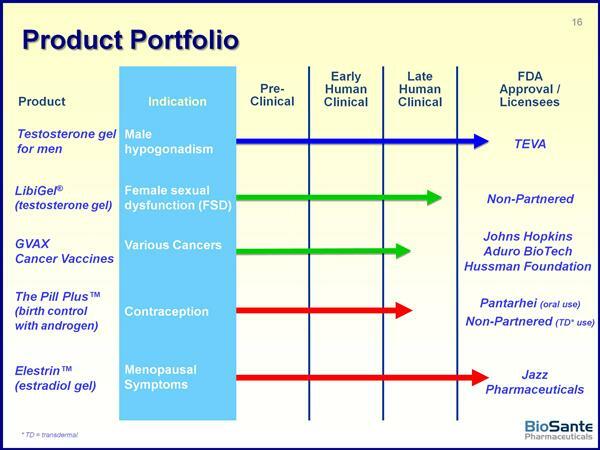 JMP Securities webcast 9/27/11 - click here for my notes. Immunotherapy webcast 10/6/11 - click here for my notes. BioCentury webcast 10/21/11 - click here for my notes. 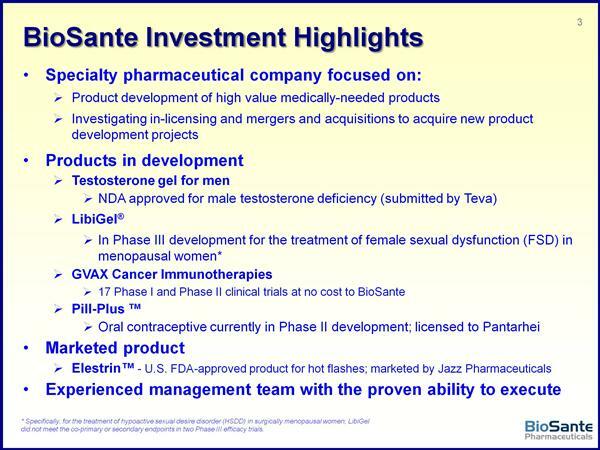 BIO Investor webcast 10/26/11 - click here for my notes. BIO CEO conference 2/2012 - click here for my notes. Roth Capital Growth conference 4/2012 - click for my notes. 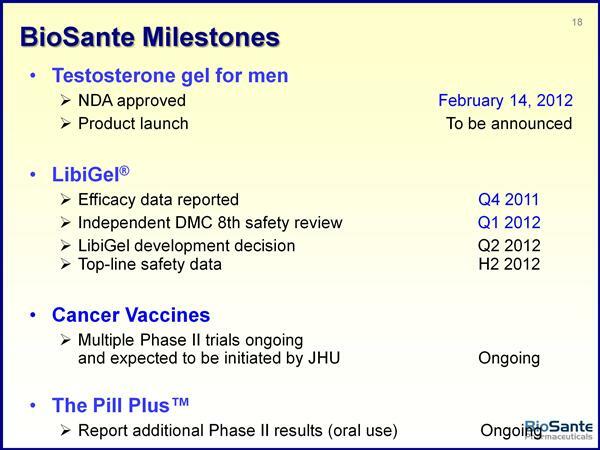 5/2012 ASCO preview and review of 1q2012 results - click for blog. 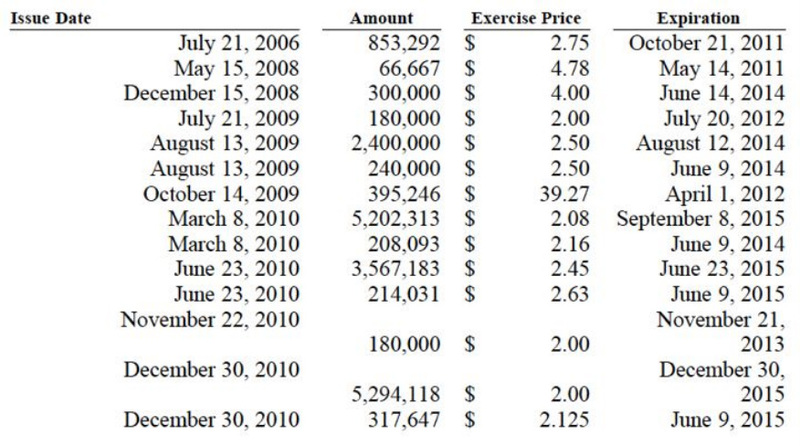 These values are not adjusted for the 2012 reverse stock split! Have $25m or 5.4m share equity standby agreement with Kingsbridge that expires in December 2011, issue at 8-14% discount. Had not sold any shares as of 12/31/10. 2010 10K: "We expect to continue to incur substantial and continuing losses over the next 18 to 24 months as our own product development programs continue and various preclinical and clinical trials commence or continue, including in particular our Phase III clinical study program for LibiGel"...."We currently do not have sufficient cash resources to obtain regulatory approval of LibiGel or any of our other products in development....we believe that our cash and cash equivalents of $38.2 million at December 31, 2010 and the additional $23.8 million in net proceeds we received from our March 2011 registered direct offering will be sufficient to meet our liquidity requirements through at least the next 15 to 18 months"
3/15/11 and 4/15/11 webcast: Cash on hand is sufficient to get to 3q2012. 5/24/11 webcast: "No intention or need to raise money in 2011"